The Trust's priorities are influenced by the strategic aims and objectives of the local authority, in their role as Client. The most important recent development is the establishment of the Public Service Reform Board (PSRB). This comprises a range of public service providers, including Link4Life, and is chaired by the Chief Executive of Rochdale Borough Council. Link4Life's business and service plans are aligned to this PSRB agenda and to continue to achieve this it will require the foresight and commitment of the Board of Trustees to ensure that Link4Life is in a position to contribute to improving the quality of life of the people who live, work and visit the Rochdale borough. Looking ahead there are significant opportunities and challenges for the Trust to harness. 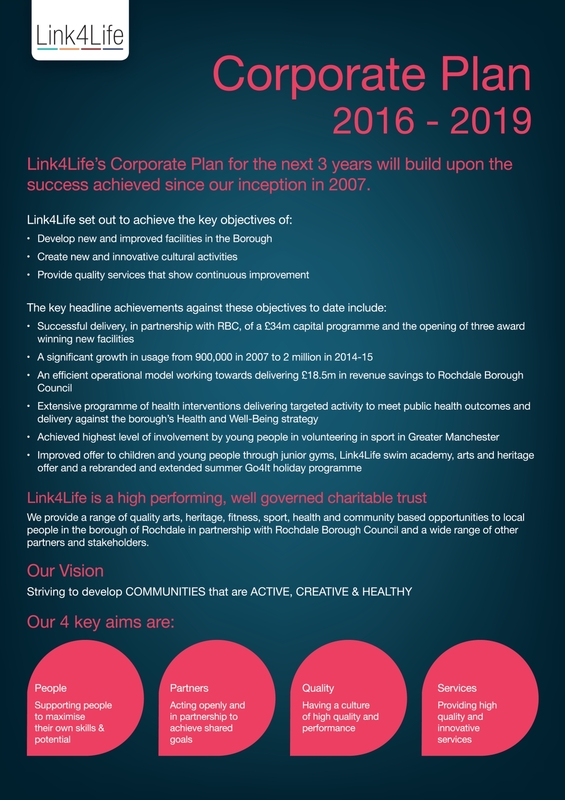 Link4Life's Corporate Strategy was reviewed by the Board in February 2014 and provides the strategic vision, key aims and business objectives of the Trust. This is outlined below.